1X 18K GOLD PLATED KEYRING WITH EUROPEAN CHARM BEADS.4 TO CHOOSE FROM. 1X 18K GOLD PLATED KEYRING WITH EUROPEAN CHARM BEADS.4 TO CHOOSE FROM. YOU GET TO PICK WHICH KEYRING YOU WOULD LIKE. You are bidding on 1 18K Gold Plated Keyring With European Charm Beads On It.The Glass Beads Are .925 Stamped Silver Cores And Tibetan Silver Charm Beads. YOU GET TO CHOOSE FROM A CIRCLE,A STAR,A HEART OR A OVAL KEYRING.IF YOU LIKE THE GLASS BEADS OR THE TIBETAN SILVER CHARM BEADS THAT YOU LIKE ON A DIFFERENT KEYRING I WILL CHANGE THEM OVER FOR YOU.I AM JUST GIVING YOU AN IDEA WHAT THE GLASS AND TIBETAN SILVER BEADS WOULD LOOK LIKE. YOU CAN CHANGE THE BEADS AROUND OR PUT YOUR OWN EUROPEAN CHARM BEADS ON.ALL YOU NEED TO DO IS TAKE THE RING OFF TO CHANGE YOUR BEADS. 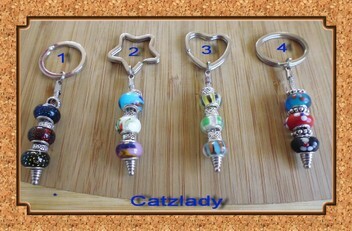 PLEASE LET ME KNOW WHICH KEYRING YOU WOULD LIKE WHEN THE AUCTION IS FINISHED. NUMBER 1:CIRCLE KEYRING WITH 3 BLACK GLASS BEADS WITH DIFFERENT COLOURED FOIL IN EACH BEAD AND 3 TIBETAN SILVER BEADS WITH A SQUIGGLE DESIGN. NUMBER 2:STAR KEYRING WITH 3 DIFFERENT COLOURED GLASS BEADS WITH DIFFERENT COLOURED DASHES AND 3 TIBETAN SILVER BEADS WITH A SQUIGGLE DESIGN. NUMBER 3:HEART KEYRING WITH 3 DIFFERENT STRIPED COLOURED GLASS BEADS IN DIFFERENT COLOURED STRIPES AND 3 TIBETAN SILVER BEADS WITH A DIAMOND DESIGN. NUMBER 4:OVAL KEYRING WITH 3 DIFFERENT COLOURED GLASS BEADS WITH DIFFERENT COLOURED FLOWERS AND 3 TIBETAN SILVER DAISY LIKE BEADS. HIGH QUALITY IN EU AND US QUALITY STANDARDS. Material:18K Gold Plated Base On Copper. Charm Bead Material:3X .925 Stamped Silver Core Glass And 3X Tibetan Silver. Length:Approx 9.5cms Long From Top Of Keyhole Ring To The Bottom Of The Stopper. THE PHOTO OF THE BEAD HAS BEEN ENLARGED. Check out my other listings for other beautiful colours.More beautiful Glass Beads to come.Plus other charms,safety chains and bracelets to come as well.